Warn points allow for automatizing certain profiling tasks. With them, you can just let a program run, but stop automatically once the number of calls to a certain predicate (or the number of times a more complex control flow tree constellation has arisen) exceeds a predefined threshold. For example, you can define a number of calls to a certain predicate that you wouldn't expect your program to exceed, and if it does, this is indicatory of a problem. Moreover, the point at which execution is automatically halted because the threshold has been exceeded may indicate the part of execution where things go wrong, for example through infinite recursion. The warn point system has been integrated with Kahina's BreakpointSystem. This allows to combine arbitrary tree patterns with thresholds, although in typical cases a one-node tree pattern will do. A warn point is a breakpoint paired with a threshold and a counter. The counter starts at 0 and is incremented every time there is a match. Unlike a breakpoint match, a warn point match has no visible effect until the counter hits the threshold. Then, the counter is reset to 0 and Kahina shows the usual breakpoint match behavior: if Kahina is in auto-complete or leap mode, it goes into stop mode, thereby pausing execution of the program. Additionally, a dialog opens indicating which warn point has matched. Warn points are defined through the warn point editor. This editor is like the other breakpoint editors, except that it has an additional input field for specifiying the threshold. 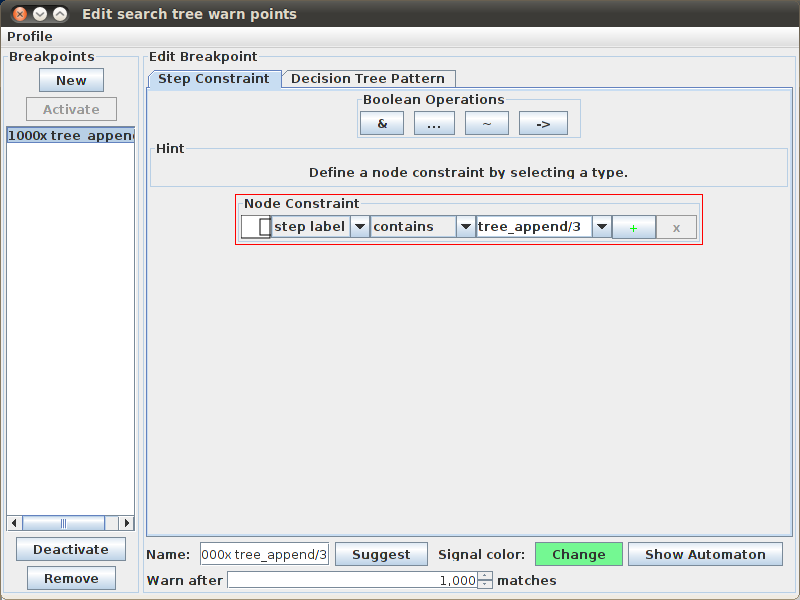 In the Node constraint area, select step label and contains and enter tree_append/3. Enter a catchy Name for the warn point, such as 1000x tree_append/3. In the Warn after field, enter the threshold 1000. Click Apply and quit in the Profile window. Prenzlgram-warn-edit.2.png​ (34.5 KB) - added by jd 8 years ago. Prenzlgram-warn-warn.2.png​ (7.2 KB) - added by jd 8 years ago. Prenzlgram-warn-edit.png​ (34.5 KB) - added by jd 8 years ago. Prenzlgram-warn-warn.png​ (7.2 KB) - added by jd 8 years ago.